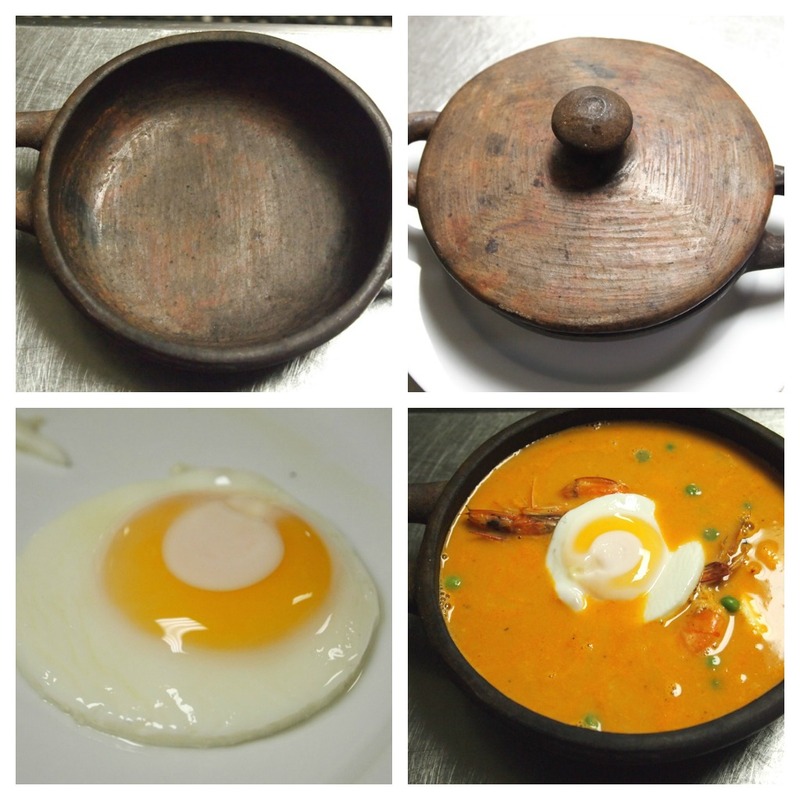 Soups were revered by ancient Peruvians, who cooked several kinds of them. Of these, one of the most popular and tasty were-and still are- chupes: thick soups, with potatoes and legumes. 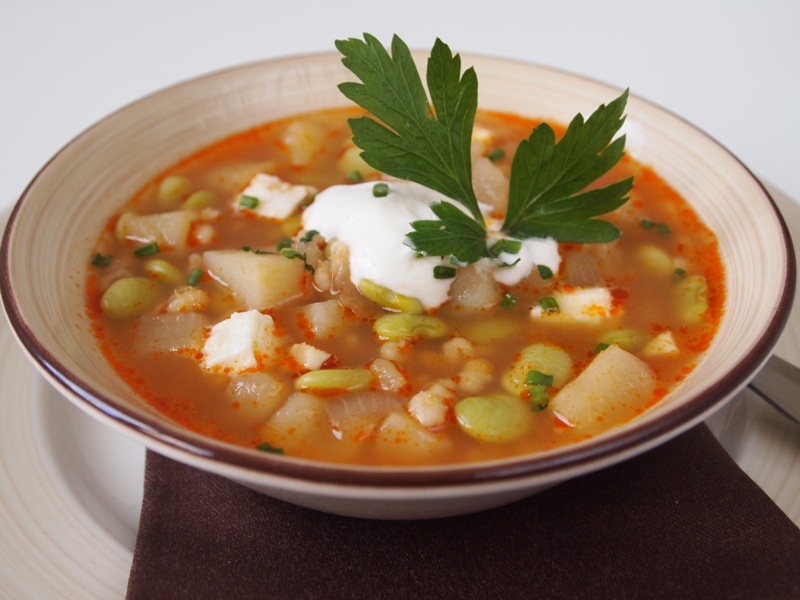 Rokros, mostly made with vegetables, were very thick, and it is believed that the famous locro is a derivation of this type of soups. On the other hand, lawas were lighter vegetables soups. 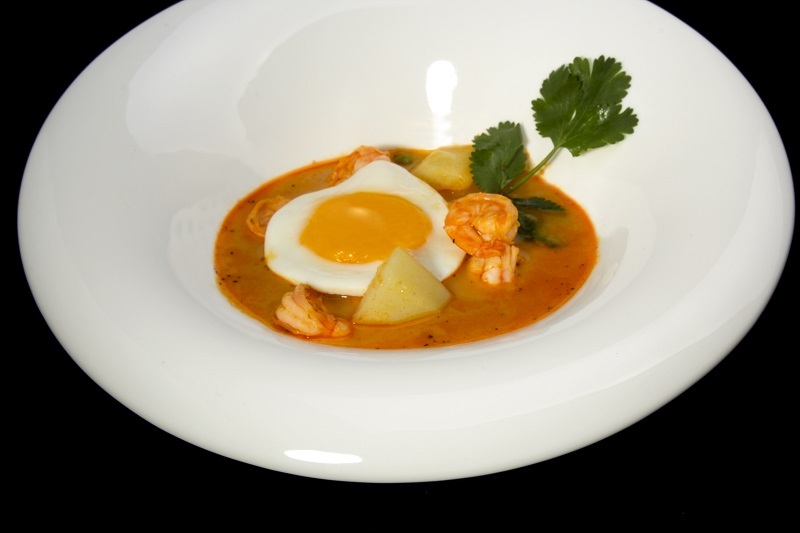 Among a huge selection of Peruvian soups there is one that stands out as a real culinary masterpiece: Arequipa’s shrimp chupe, or chupe de camarones, in Spanish. This is a hearty, extremely satisfying, empowering, and some even say aphrodisiac dish; a volcano of flavor, color, and texture. It is usually served in large bowls, and although Peruvians have insatiable appetites, I would recommend to have it as the only course of the meal, because I don´t think you´ll need more food for many hours after this. Maybe not even till the next day. 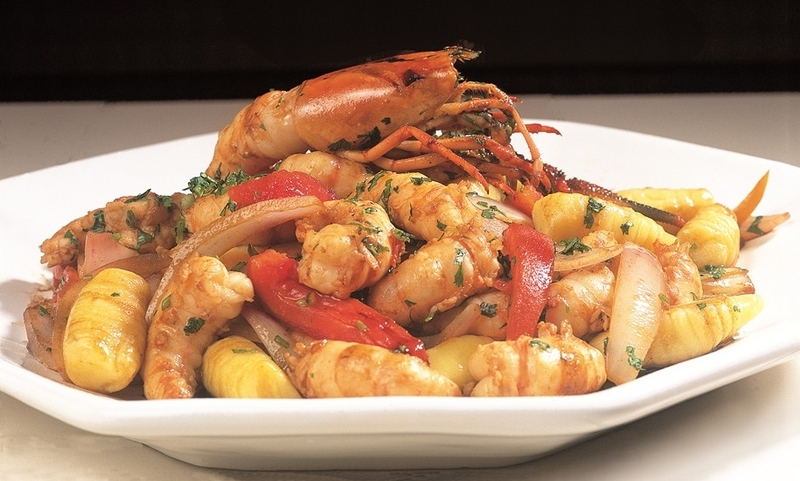 In Peru we use every part of the fresh shrimp to improve the flavor of the dish. The shells and heads are the best ingredients for a flavorful stock, which is the base for this chupe, and they also make wonderful sauces with an intense taste and color. Shrimps have two sacks inside the head. You should discard the black one, and keep the other one –the grayish or green roe- because it is a hidden treasure of flavor. If you keep just the roe, you should know that a spoonful of this is enough to transform any dish from good to absolutely extraordinary. To make your own stock with the heads and peels of the shrimp, fry them in 1 tablespoon olive oil, stirring, and after 5 minutes add ½ cup white wine, and bring to a boil. Add water to barely cover the peels and bring to a boil, turn down the heat, and simmer for 30 minutes, or until you have a rich stock. 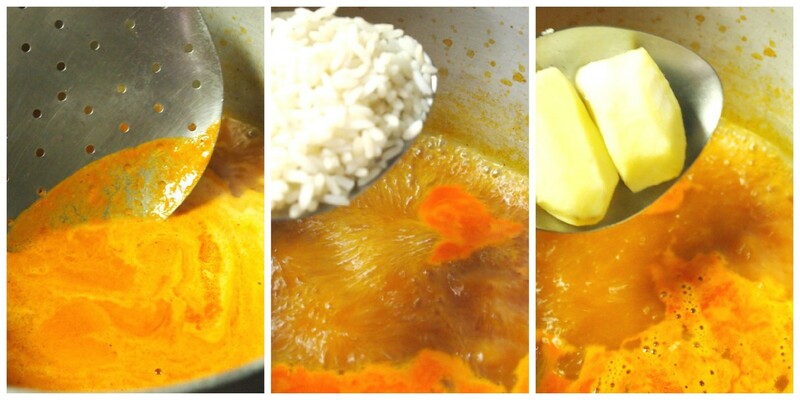 Process everything in the blender until liquid, strain pressing the solids and reserve to use as the liquid for the soup. If you don´t have the time for this process, or can´t find whole shrimp with heads included, use the best comercial shrimp or fish stock available in the market, but the results won´t be the same. Follow the instructions of the recipe carefully and get ready for one of the most amazing soups you’ll ever taste. Serve it in deep porcelain soup bowls or in earthenware bowls. Rustic or fancy, shrimp chupe is delicious. Plan on taking time for a nap after lunch, because other than making you content, this will surely make you sleepy too. You can find this and many other recipes in The Everything Peruvian Cookbook, the most complete introduction to Peruvian cooking. Heat the achiote oil in a saucepan over medium heat. Add onion, garlic, oregano, and sauté until golden. Add tomato paste and continue cooking for 5 minutes, then add the shrimp stock, and bring to a boil, skimming the stock every few minutes. Turn the heat to medium low, add rice and simmer for 15 minutes. Add potatoes and corn, and continue simmering until the potatoes are tender, then add the peeled shrimp. Cook for 3 minutes. Add milk, salt, and pepper, and turn off the heat. Add cheese and green peas. Heat the tablespoon of oil in a skillet and fry the eggs, one by one, sunny side up. In each plate put some shrimp with rice, one or two potatoes, chese cubes, green peas, and the hot soup around this. Top with a fried egg and garnish with parsley and 2 large shrimps. Serve immediately. So the shrimp goes into the soup with the shell still on? Does that mean you scoop out the shrimp and shell it as you eat the soup? Sounds very interesting! Hi Jackie! Thanks for your comment. The shrimp should be peeled and cleaned before cooking. I just fixed it. Hope you like it! 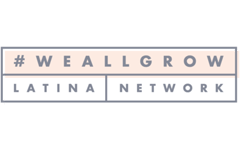 La cocina peruana y este blog se pasan de BUENOS!! Esta receta se ve estupenda, todo lo que tenga mariscos me encanta. Anotada! Qué bien que te gustó la receta, Cristina! Cuando prepares el chupe nos envías fotos para publicar en Facebook. Hola, gracias por compartir esta receta! una pregunta sobre el caldo: al final se licuan los camarones con todo? o sea con la cabeza y la concha? Hola Daniela. Para el caldo se licúan las cáscaras con la cabeza, pero se dejan las colitas peladas y enteras para servirlas. Gracias por visitarnos. Nos cuentas cómo te sale el chupe y nos mandas fotos! Hola gracias por la receta. para el shrimp stock se frie todo el camaron? Oh se corta la cabesa y cascara y esto es lo unico que se frie? Hola! Qué bueno que te gustó. Hacemos el caldo de camarón con las cabezas y las cáscaras de las colas. Las colitas las reservamos para el final para que no se recocinen. Gracias por visitarnos! So theres no water added to this? just pure oils ?…. Hi Justin. 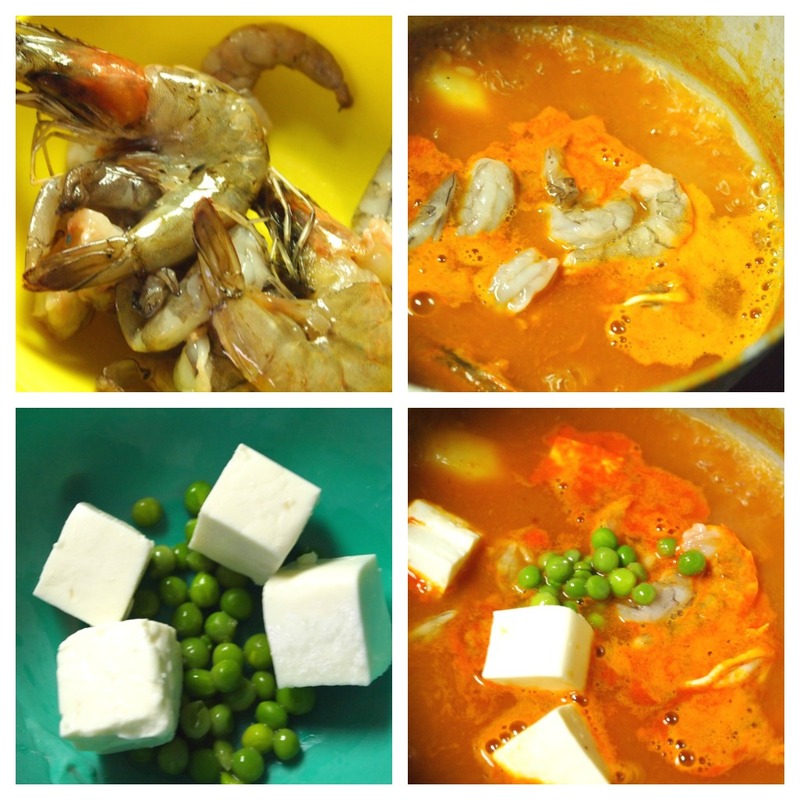 The recipe uses shrimp stock to make the soup. 1/2 cup of achiote oil + 1/3 cup of veg oil seems like a lot of oil. Hi Linda. The vegetable oil is for frying the eggs sunny side up. Depending on your frying pan you can use just a few drops oil, it´s up to you. That made me think that I should update the recipe and add a few words about this. Thank you so much! Can I make achiote oil by warming vegetable oil, say 1 cup oil with a tablespoon of achiote seeds? Can you suggest a ratio of oil to achiote seeds? I also have achiote paste from the Yucatan – will this be the same? I can’t wait to make this – your version seems to be the most authentic of the recipes I have. I remember loving this when I lived in Peru. Hi Cecilia. You can make achiote oil with vegetable oil and a tablespoon achiote seeds, and warm over very low heat until the oil in infused with the red color of the achiote seeds. 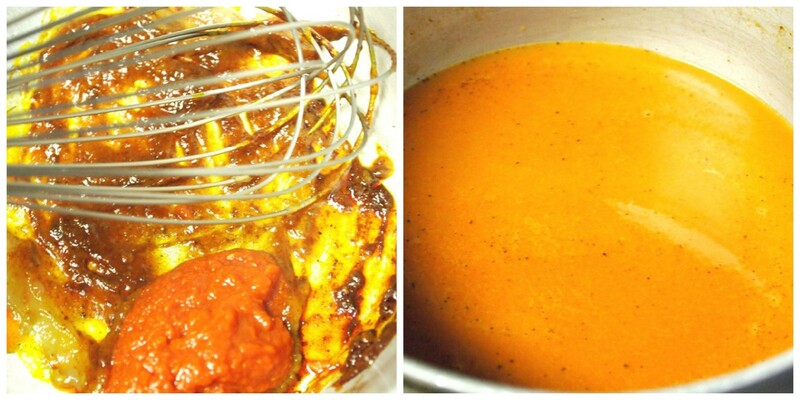 You can also use achiote paste, just dilute in in a little water. Thanks for visiting. Thank you so much for posting this recipe. When my husband and I lived in Alexandria, VA, we used to visit this little “hole in the wall” restaurant (Taso’s) that served this soup, only without all the rice and veggies. It was literally the soup with shrimp (including a few whole ones, heads and all for show) and cilantro floating on top. They served it with warm, fresh tortillas (the kind that are thick and almost bread-like – not the store bought, flat/thin ones) and it was heaven! I’ve been searching for a comparable recipe since that place changed owners and yours is the first to even come close. Thank you, thank you, thank you! I’ve missed this soup SO much. Thank you for sharing with us those wonderful memories. aji panca is in the list of ingredients, but no mention in the recipe. Just an omission, I guess? 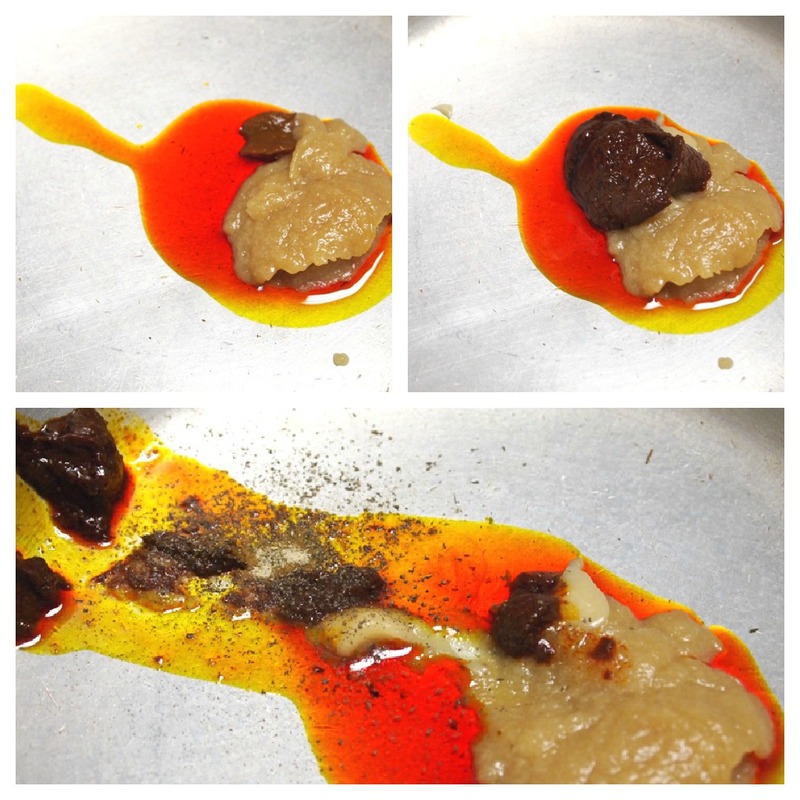 Aji Panca is pepper….so look at #2 up above.